The quarterly report is a financial update by the public listed company on a quarterly basis to the public investors. Financial analysts put lots of focus in this report because it can affect the price movements of the stocks in the short term. There are several criteria cannot be ignored in the quarterly report as below. Earnings per share (EPS) serve as an indicator of the profitability for a company. This measurement shows the indication of the company’s ability to generate, sustain and grow its profits. The higher the net profit, the higher the EPS (unless bonus issue or right issue occurred). 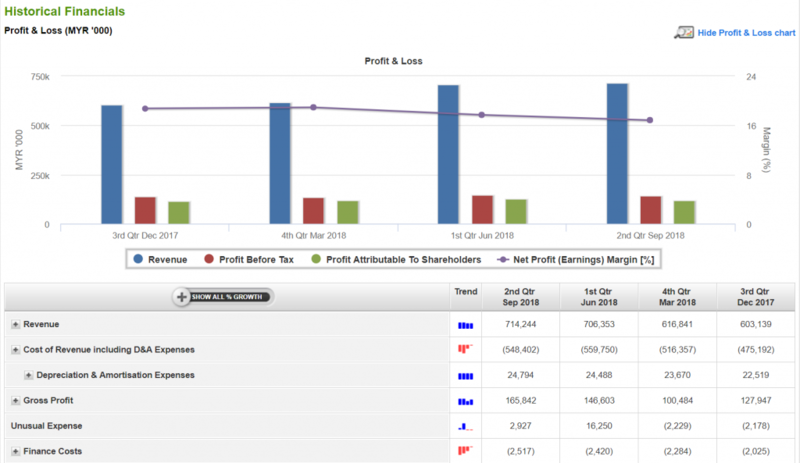 The quarterly adjusted EPS can reveal the latest financial profitability and have a better understanding of business performance. The performance can be measured based on whether the EPS meets, misses or beats analysts’ predictions and will have a substantial impact on the short-term share price. Invest in a business is a long-term activity, so Investors tend to invest in good prospects company. Hence, stocks that can consistently grow their sales and earnings are expected to perform well in the long term. However, it is difficult for companies to outperform analyst expectation every quarter due to the short time unstable economic situation or political news. Therefore, for stocks that perform well in each quarter, they are usually the industry-leading stocks due to their ability to boost sales while controlling costs and expenses to ensure the earnings growth. For some industries like food and beverages industry, it has cyclical sales performance due to peak seasons like festive season and low season. Comparisons quarter by quarter may not accurately determine an overall business performance, so investor shall include past few years quarterly results into their analysis to understand the peak and off-season conditions. Then, they may get more ideas at the timing of entering or exiting the market. 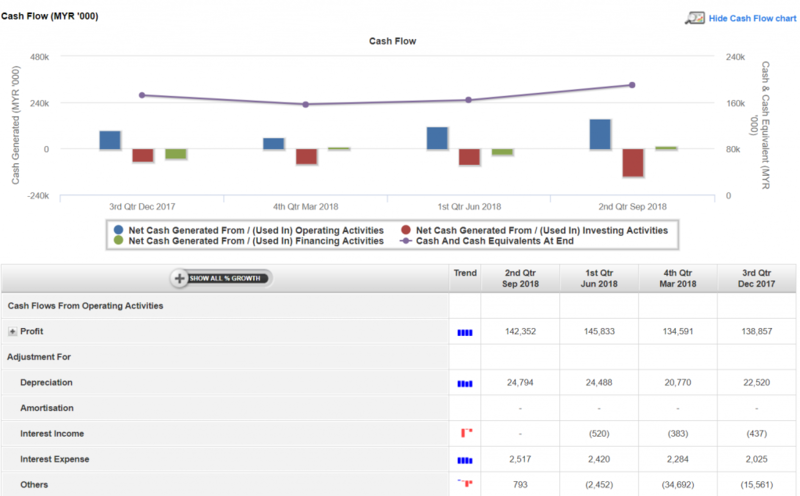 Stable cash flow is essential for a company to ensure its financial liquidity. When a company can generate high positive cash flows, this will create more value for shareholders and enables the company to expand their business, pay a special dividend for shareholders, repay debts and cushion future financial challenges. A profitable company can fail if the operating activities do not generate enough cash to maintain liquidity. If the company fails to convert sales into cash on time, their cash liquidity will lead to a cash flow shortage and affecting day to day operations. The management always interprets the quarterly performance and discloses further plans in the quarterly result or in a press release. This is generally the moment investors will form their perception towards how effective and efficient the company overcome current obstacles and future challenges. More often than not, sharing related previous success stories of how issues and crisis were managed are able to display the company’s commitments towards the interests of its shareholders. On top of that, it also provides investors with clarity and to a certain extent, assurance, on the direction and dynamism of the company they have invested in. Although the quarterly report is not audited, it is still essential for investors to make any decisions, as the annual report is only published once a year and many variables may occur within 12 months. To keep their investment safe, investors should not skip the company’s financial reports and protect your assets. Investors should not judge a company by just looking at one of the criteria because a good company will not be only good in one aspect. Instead, they should consider more aspects before making a decision. Written by Evelyn Yong | 7th December 2018.